I grew up eating ramen a lot. 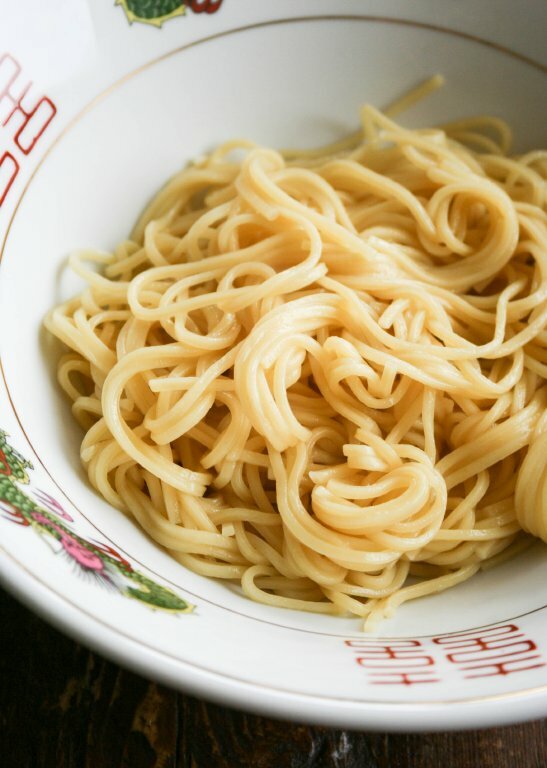 It’s so popular in Japan, and when I found out that a lot of Japanese people post ONLY ramen pictures on their Instagram page, I was not surprised. Some of them go out to eat ramen every day, and they don’t run out of new ramen shops to try! Anyway, I’ve become a little more serious about ramen myself recently. When I found this dried ramen noodles at Amazon which had great reviews, I had to order a package. 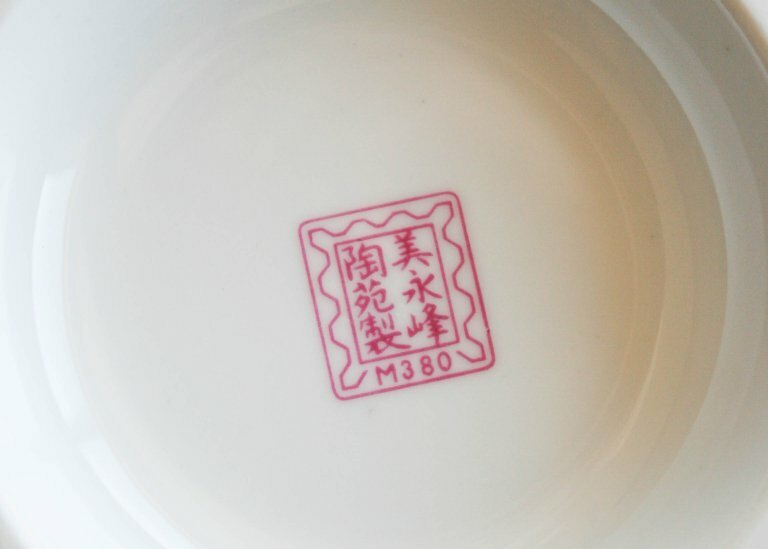 I also got myself a new bowl. 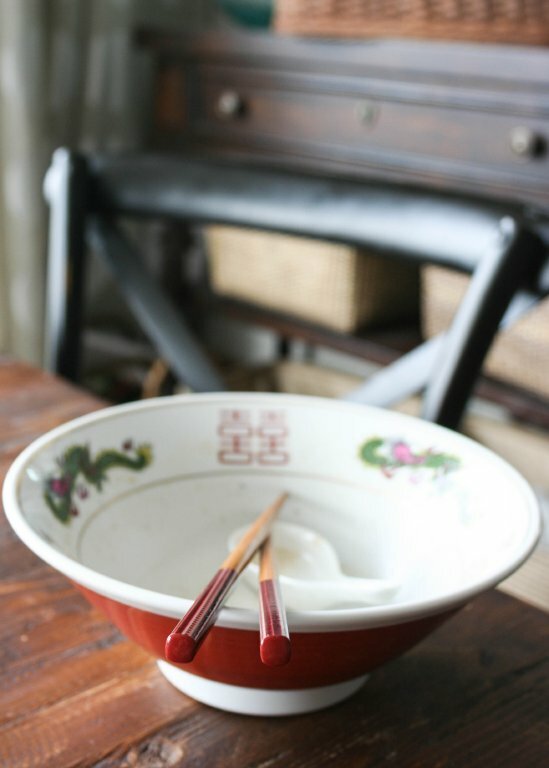 I always wanted to have a traditional ramen bowl. 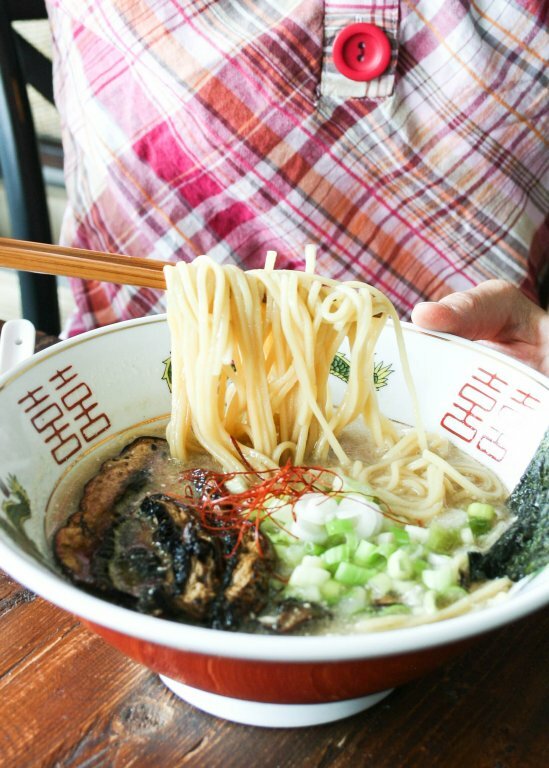 I typically like a lot of toppings on most dishes, but when it comes to ramen, I’m probably a bit more traditional and stick with a few. 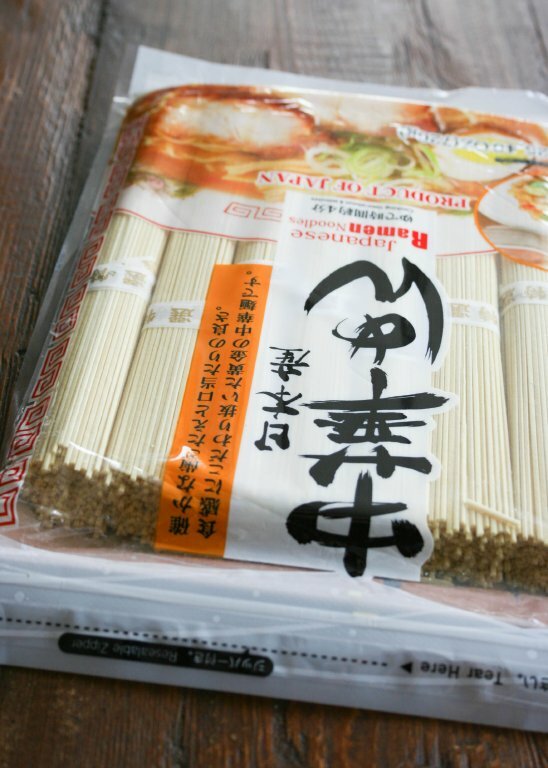 The most popular ramen topping is probably “Char Siu” or barbecued pork slices. 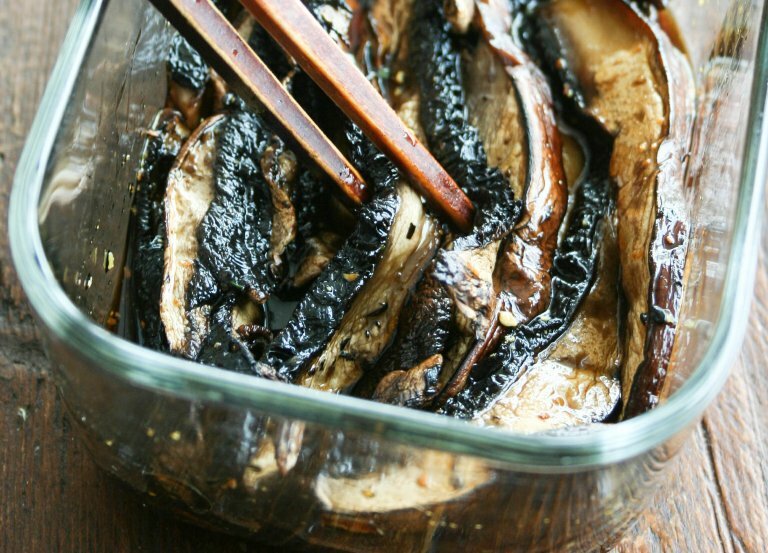 Instead of pork, I prepared yummy portabella mushroom slices. 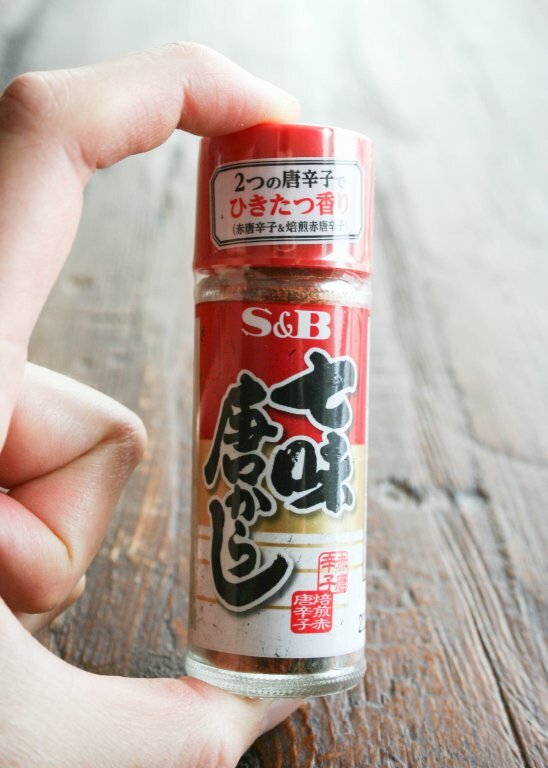 The mushrooms were so delicious; a bit sweet and a bit spicy from these Japanese “shichimi” spices. The noodles were cooked perfectly. Ramen looked so good in my new bowl! Made me feel like I was back in Japan. I really liked these noodles as they are so authentic. They have the right chewiness, flavors, and look. 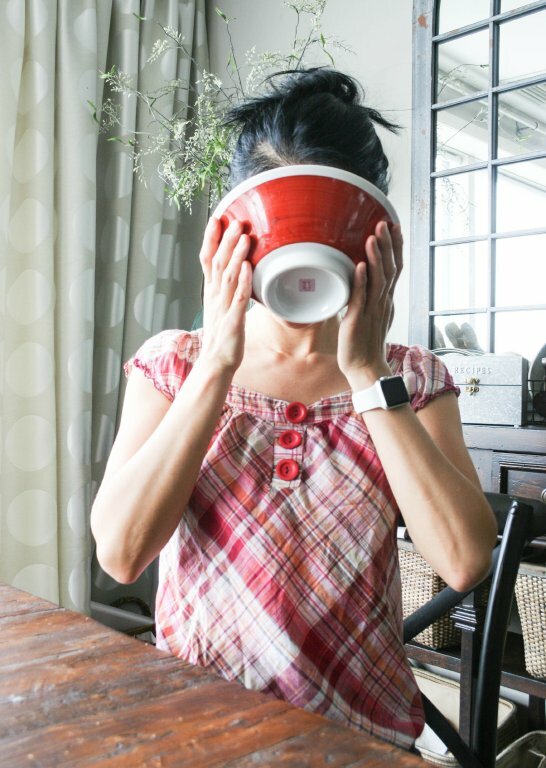 The soup turned out to be super tasty too. 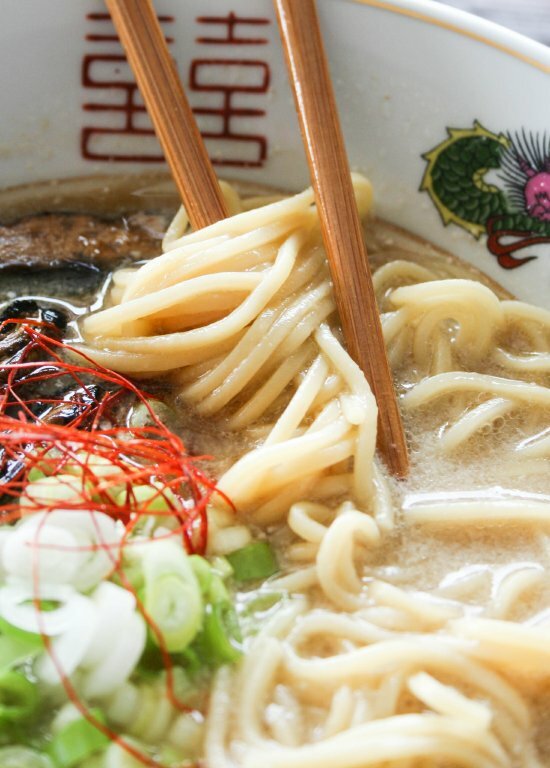 Tonkotsu ramen is known for its rich flavored soup. 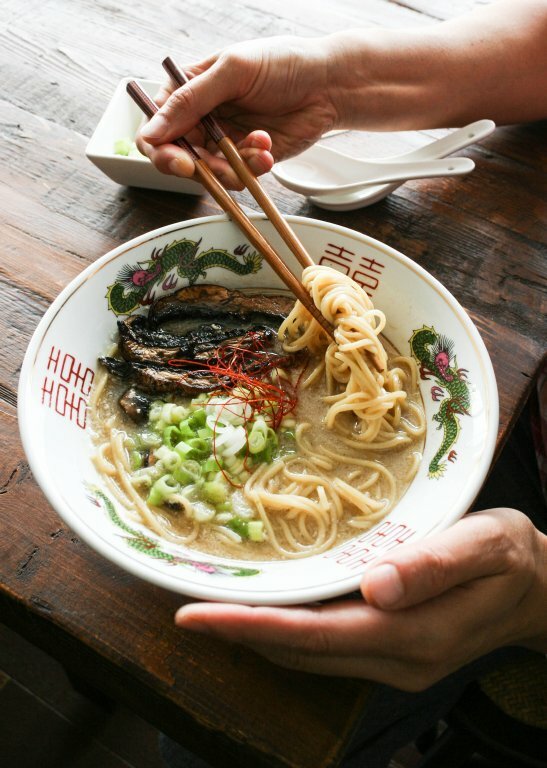 “Tonkotsu” ramen became quite popular in the U.S., but I’m not sure if people really know what that means. 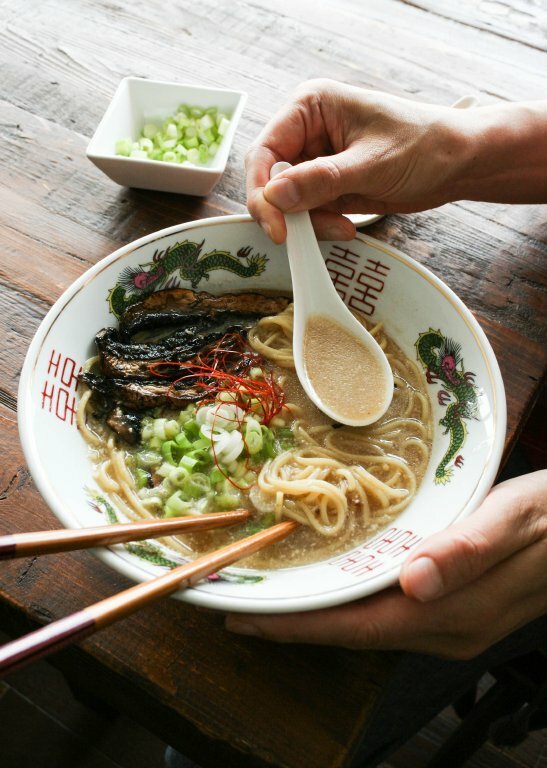 Tonkotsu literally means “pig/pork bones”, and you make your soup from them. “Tonkatsu” is another popular Japanese dish in the U.S., and I sometimes hear people say “Tonkatsu” ramen, but that’s incorrect, unless the ramen is served with “tonkatsu” as a topping. Just a little not-so-necessary piece of information (lol). 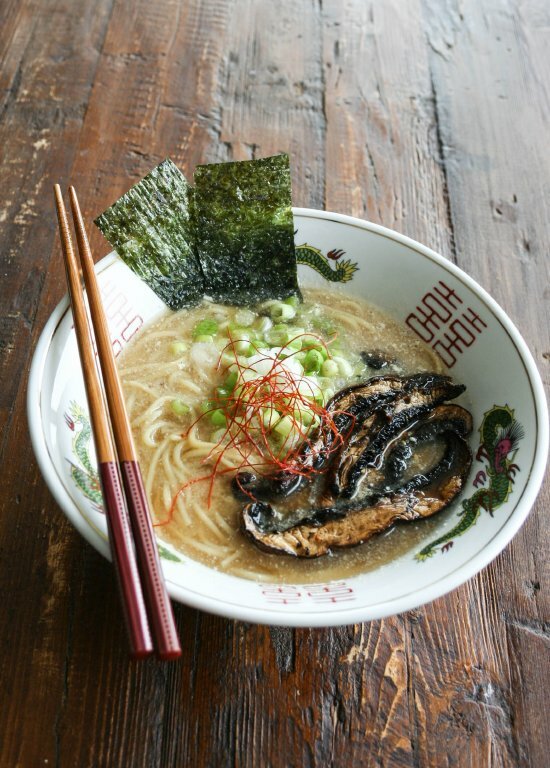 But if you say “Tonkotsu ramen” correctly, you will certainly look like someone who knows your ramen (lol). 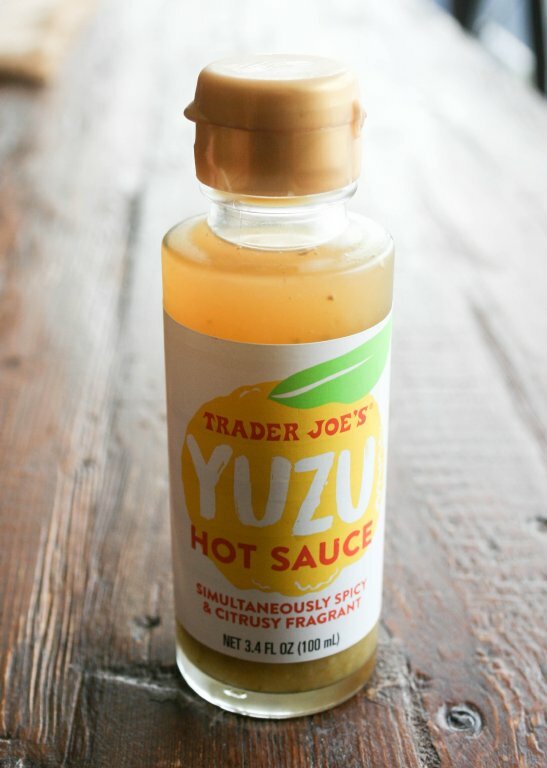 The soup was delicious as it was, but a little splash of this Yuzu hot sauce I found at Trader Joe’s brightened up the flavors. I always wanted to take a picture like this. If you eat good ramen, I think it’s obligatory. And this is an acceptable way in Japan to finish your soup. 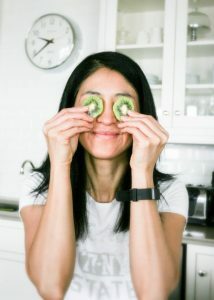 I do not recommend doing this in the western countries though. This was written by Reiko Tanaka. Posted on Monday, August 13, 2018, at 10:07 pm. Filed under Asian Food, Japanese Food, Mushrooms, Noodles/Pasta. Bookmark the permalink. Follow comments here with the RSS feed. Post a comment or leave a trackback.